A diagram of the muscles,tendons and bones involved with the ankle. We will start with bones and specifically the fibula,tibia and talus. The tibia is a larger bone on the interior carrying majority of the weight of the body while the fibula is a thinner bone that runs on the exterior of the leg. The talus is a bone embedded inside the foot that is transferred weight from the tibia. this allows you to spread the weight anteriorly or posteriorly throughout the foot. The bones serve as the structure and strength of the foot and lower leg. Moving onto the ligaments of the ankle they can be sorted into two categories Medial Collateral ligaments and the Lateral Collateral ligaments. The Medial Collateral ligaments, more commonly known as your MCL, are there to prevent abduction, limit plantar flexion and dorsiflexion. This string of ligaments also connects the top of the tibia, or shinbone, to the bottom of the femur, or thighbone. The MCL can be injured, normally via a direct knock to the knee and mostly during contact sports. Specifically to the outer aspect of the knee stretching or tearing the MCL. For possible symptoms of an MCL tear then I would recommend this article Injury of the MCL. The Lateral Collateral ligaments limit plantar flexion, resist adduction and limit dorsiflexion. There are other ligaments present in the ankle joint however, many of which support similar functions and are interwoven making it harder to self diagnose injuries or problems. Tendons are next and a famous one in the ankle is the Achilles tendon. This links the calf muscle with the calcaneos in the rear base of the foot. This is the most important tendon for running,walking, jumping and other activities. It is especially important that you stretch out this tendon and the calf muscle it attaches to. The tendon also allows the raising of the toes. 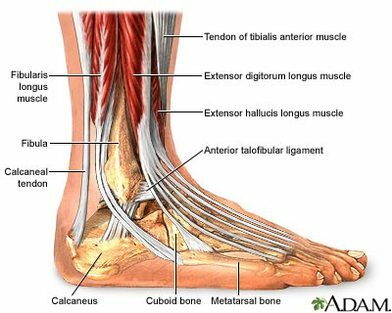 Another tendon is the posterior tibial tendon that assists with interior rotation of the foot and supports the natural arch of the foot. The final tendon in the foot and ankle is the anterior tibial tendon that allows you to raise the foot. The only muscle that links with the ankle is the calf muscle. The muscle itself is made up of two separate muscles one is the Gastrocnemius on the outside of the leg involved in plantar flexion and the other is the Soleus on the interior of the leg involved in standing and walking. That brings us to the end of my first body mechanics post. If anything is too technical and needs further explaining then don’t hesitate to contact me via Instagram DMs or E-mail.